Hundreds of penguins that apparently starved to death are washing up on the shores of Brazil. Biologist Thiago do Nascimento says about 500 of the dead birds have been found in the last 10 days in Sao Paulo state. Nascimento says they're mostly Magellan penguins migrating north from Argentina, Chile and the Falkland Islands in search of food in warmer waters. He said Tuesday that autopsies done on several revealed their stomachs were entirely empty, indicating that they likely starved to death. Scientists are investigating whether strong currents and colder-than-normal waters have made it tougher for the penguins to hunt the fish and squid they normally feed on. Two years ago, more than 400 penguins, most babies, were found dead on the beaches of Rio de Janeiro state. Veterinarian Thiago Muniz said he believed overfishing had forced the penguins to swim further from shore to find food, leaving them more vulnerable to getting caught up in strong ocean currents. 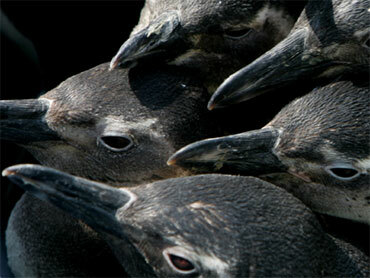 For the past several years Brazil has airlifted wayward penguins back to more polar climes.